There's a new lifestyle magazine out of San Francisco called Drink Me. Drink Me is published every two months and is currently distributed to select locations throughout the San Francisco Bay Area. The first pocket-sized edition includes some nice articles and even a profile of fellow Vail survivor Jackie Patterson. My favorite article from the online edition was written by Jon Santer and covers some of the basics of bar behavior. Head over to the site and sign up for their e-mail updates so you can keep track of the latest developments. Doug over at the Pegu Blog has tried every cocktail app he can get his hands on. He's got reviews of all the available apps. Right now he's running a contest on his blog and giving away free prizes! Head on over to Doug's site, check out the reviews and take a chance to win some prizes. There's a wide world of cocktails out there. Websites and books that list thousands and thousands of recipes. The question I have when looking at these kitchen sink recipe collections is always "Do I really need 14,000 cocktail recipes?" My answer is always no. Working in a bar, as a professional bartender, you probably need 50 drink recipes on the fly. When you're entertaining at home, you probably need to have about ten or twenty "go-to" favorites that you can whip up and impress your guests. How do you get from the thousands and thousands of recipes available, to the recipes you really need? I wanted to take a shot at my own list. I was shooting for 101 recipes. I decided to list the 101 best and most important cocktails I could think of. What do you put in, and what do you leave out? That was the hard part. After I came up with my list, I wanted to be able to use it, out in the field. A sort of field guide to my favorite cocktails. So I turned it into an iPhone application I could take with me anywhere. Through the magic of the iPhone AppStore, I've made it available to anyone with an iPhone. 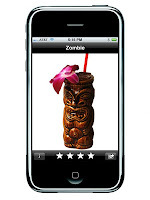 You can learn more about my 101 Cocktails app here, or purchase it here. I'll be going through some of the recipes here at the Cocktail Hour as individual posts. Are you still here? Go buy it! It's Mixology Monday again. This time we're looking at Hard Drinks for Hard Times. Matt Rowley is our host, and along with lots and lots (and lots?) of other people out there, Matt's been cut loose. He's been made redundant from his advertising job. In an effort limit his bar budget, he has curtailed new purchases and is using zen-like cellar management. He's using all the bottles he already has on hand, finishing up bottles, or breaking open those bottles he's been hoarding. I appreciate both Matt's situation, and his approach. I've got a different idea. I want you to get more for less at the local shop. Think of it as a small stimulus package. If my budget were really tight, I'd like a cocktail for $1.25. There are whiskies out there that are such great values, it's hard to believe. I'm not talking about nasty rotgut, the kinda stuff you wouldn't ever want to touch. I'm talking about excellent, high-quality whiskies at rock bottom prices. 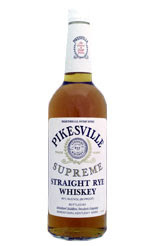 Pikesville Rye is widely distributed, and is usually available for around $11.99. Some parts of the country get it for $9.99. Let's call it $12. This is good rye at a bargain price. If you have a bottle of bitters on hand, you're all set. If you lost your bitters bottle, or left it at work, you'll need a bottle of that, but it's an investment that will probably see you through for some time. (You may still have bitters in the bottle after the economy turns around.) Let's call it $6 for 4 oz. There are lots of values to be had, if you know where to look, and you know what you like. Dave Wondrich recently had a posting in Esquire that looked at some value options and I'll be looking for more ideas form this month's Mixology Monday Wrap-up. The Grand Marnier Navan Mixology Summit is one of the best bartender events going. It's hosted by Grand Marnier and led by Steve Olson and his posse of bartending geniuses. This is an event you don't want to miss. Last year I had the good fortune to go, and I met incredible bartenders like Sierra Zimei, Todd Appel, James Macknyk, Debbie Peek and Myong Park. And that was just on the bus from the airport to Vail! The Mixology Summit gives you the opportunity to meet, exchange ideas, and socialize with some of the top bartenders in the country. You'll also get to try great cocktails, go skiing, eat great food and have an all-around fantastic time. Polish up your best and most creative Grand Marnier recipes and apply now. The window for entries is open now, and you only have until November 30th to apply. If I'm lucky enough to go again this year, I hope to see you there too! All the rules, and the entry information is available on the Mixology Summit website. On Tuesday I spent the day at BarSmarts in San Francisco. BarSmarts is an advanced bartending course put together by B.A.R. and Pernod Ricard. The program involves four units of book and video training and culminates in an all-day event featuring lectures, classwork, written tests and a practical hands-on test of bartending skills. 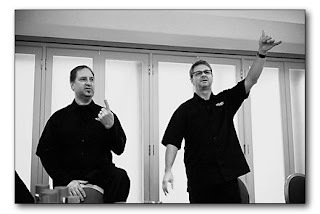 Steve Olson teaching Doug Frost the "hang loose" sign. The lectures were interesting, and a great opportunity to hear from industry luminaries F. Paul Pacult, Steve Olson, Andy Seymour, Dave Wondrich, Dale DeGroff and Doug Frost. The written test was comprehensive, and somewhat tricky. I tried to make a deal with Camper where he could take my written test and I'd do his practical. We couldn't come to an agreement though, and he probably did better on the practical than I did. He practiced the before the event. I was confident about the practical test until I entered the room and was told I'd be making my drinks for Dave Wondrich. I broke into a cold sweat. 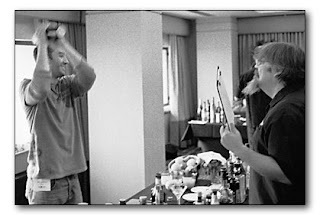 I felt I knew a bit about Dave's taste in cocktails, simply from reading everything he's ever written about cocktails. I thought I'd try to throw an old-school twist to each of the cocktails I was asked to make. Dave Wondrich watches a Daquiri being shaken (!) during the practical tests. Dave told me to make a Martini, and Old-Fashioned, and a Daquiri. Great. I know all these recipes, and make them all the time. On Monday, I had even watched this video of Dave making an old-fashioned on TV. I thought my Old-Fashioned was going well, until I went for the pyro. Instead of this, which is normally what happens, the orange just kinda fizzled and blew out my match. Dave tasted the drink and said it was strong, but good. Which was similar to the response in the video, so I felt it was OK.
For the Daiquiri, I thought I'd go for a little secret ingredient. Deviate from the recipe they gave us in the book. I asked Dave if I could add a little something special to the standard recipe and he agreed. I planned to use Maraschino as part of the sweetener in the drink. I added the rum, lime and maraschino to the tin, and started to look for the simple syrup. I couldn't find it, and Dave had to tell me where it was. Then I proceeded to STIR the daquiri. I don't know why, but for the daquiri I usually stir it. I think it gives it a nice texture and looks nice and clean. But for the test, I think this is the wrong answer. (Obviously they wanted me to build a drink, stir a drink and shake a drink.) There is a general rule of thumb for this too. If the drink has fruit juice in it, shake it. Simple. Knowing the rules, and breaking them when you want to is one thing, but I think for a test, you should probably try to do the basics to show you actually know the rules. I think I got too caught up in trying to be fancy, when I should have tried to stick to the basics. I won't know the results of the written and practical tests for a few weeks. I was impressed with the program and pleased to have taken part in it. I have to hand it to Pernod-Ricard for going out of their way to raise the bar for bartenders, and build a community at the same time. Well done. More information about BarSmarts is available on the BarSmarts website. There are plans to move the program into several markets in the future, and also offer a "BarSmarts Wired" program for on-line bartender education. When I find out the results of my BarSmarts tests, I'll post them here. Pass or fail, at least I can say "I made cocktails for Dave Wondrich. And he spit them all out." go to Plymouth Distillery and drink gin. fly to iceland, drink water, go snowmobiling. visit secret bar with Joerg. I wish I had a to do list that looked like Jeff's, but I don't. So instead I present my WhiskyFest Top Ten list. an "official bottling." I'm anxious to try it. A great lineup. George T. Stagg and Sazerac Rye? Awesome. Always a great table. Stop by and see what's new on Islay. Not usually at the show, these are some great whiskies. Grain Whisky! Mr. Glaser is a nice guy too. Great whiskies! They probably won't bring the rye, but I can dream. I haven't found this in my local shops. I like Rye. Four roses is back in California with a vengence. Very excited about the Small Batch and the Single Barrel. Most importantly, make sure you have a ticket for WhiskyFest. By the way, I think Jeffrey Morgenthaler makes all that stuff up. I'm not even sure he's a real person.